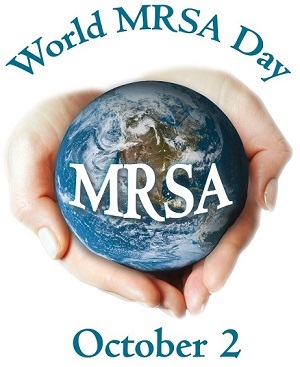 MRSA Survivors Network, the prominent advocacy group in the USA is joining with organisations across the world for World MRSA Day - October 2nd. MRSA activists, including MRSA Action UK, are calling for world unity from governments, the healthcare industry and the community for a greater response to MRSA and other resistant pathogens. In a bid for everyone to gain a greater understanding this web-page gives a potted history of MRSA. October 2nd 1960 was the day when Professor Patricia Jevons first observed Staphylococcus aureus that was resistant to the antibiotic Meticillin. This then new drug, also known as the chemical compound BRL 1241, had been published in the British Medical Journal as a suitable alternative to Penicillin for resistant strains of Staphylococcus aureus just a month beforehand (September 3rd 1960). There was some caution reserved in the publication with resistance being shown in lower doses of the drug. Shortly after in February 1961 the British Medical Journal cited Professor Jevons observation of the resistant pathogen that we now know as MRSA. It soon became endemic in UK hospitals and around the world. Now we are seeing its spread in the wider community. With much more virulent strains of other "superbugs" evolving we wonder what the next decade will bring. M stands for Meticillin, a chemical derivative of Penicillin, first called BRL 1241 because it was developed during the 1950s in the Beecham Research Laboratories at Betchworth in Surrey. R stands for resistant; the development of Meticillin resistance in a hospital was first detected in October 1960 in Guildford, also in Surrey. And SA stands for Staphylococcus aureus (commonly called Staph), the bacterium that causes boils, carbuncles, abscesses, osteomyelitis and most wound infections after surgery. Staph was discovered in the late 1870s by Alexander Ogston, a surgeon at the Aberdeen Royal Infirmary. The name Staphylococcus is derived from the Greek word staphyle or "bunch of grapes" because of the characteristic cluster-like appearance of the bacteria under the microscope. Due to its golden appearance Staphylococcus aureus was chosen (Aureus being a Roman golden coin). There are 32 species of staphylococci, but only 17 are indigenous to humans. Staphylococcus aureus is especially prevalent due to its surface proteins, which allow the organism to bind to tissues and foreign bodies coated with collagen, fibronectin, and fibrinogen. This permits the bacteria to adhere to devices such as sutures, catheters, and prosthetic valves. Alexander Fleming was studying Staphylococcus aureus at St Mary's Hospital London when he discovered Penicillin in 1928, and the first patient to be treated in the first clinical trial of the new antibiotic at Oxford was infected with it. Albert Alexander, a 43-year-old policeman, was suffering from a spreading infection of his face that had started with a rose thorn scratch. He had lost an eye and the infection had spread to his lungs and his shoulder. On 12 February 1941 he was injected with Penicillin made by Howard Florey and his team. Alexander's condition improved dramatically. Treatment continued for five days. But ten days later he relapsed, dying of staphylococcal septicaemia on 15 March: the supplies of antibiotic had run out despite attempts to make up for the depleted supply by extracting it from his urine for re-use. Penicillin revolutionised the treatment of Staphylococcal infections. But its power over them began to wane soon after its general introduction. The first naturally occurring Penicillin-resistant Staphylococci were noted by Fleming in 1942. Between April and November 1946, 12.5 per cent of Staphylococcus aureus strains isolated at the Hammersmith Hospital in London were Penicillin-resistant. By early 1947 the percentage had tripled. The bacteriologist Mary Barber showed that this rise was not due to the development of resistance while patients were being treated, but due to the spread of a Penicillin-resistant strain in the hospital. Some Staphylococci had the ability to make Penicillinase, a Penicillin-destroying enzyme. The introduction of Penicillin gave them an evolutionary advantage over strains killed by the antibiotic. Meticillin was developed in response. Florence Nightingale had revolutionised healthcare in the Crimean War, and following her methods after the turn of the century wards were well ordered and clean, strict attention to hygiene, assiduous hand washing and aseptic conditions meant every precaution to avoid infection was taken. We were however about to become over reliant on antibiotics, and a culture developed where the strict discipline and skills needed to do the sick no harm seemed to relax. With bacteria developing more and more resistance, and the most common surgical bacteria Staphylococcus aureus evolving, the first culture of Staph aureus found to be resistant to Meticillin was identified under a microscope at Colindale Laboratories in London by the late Professor Patricia Jevons, on October 2nd 1960. This was followed by an outbreak at Queen Mary's Children's Hospital, Carshalton in 1962. MRSA has now evolved and spread, is endemic in our hospitals, and now in the community. The countries in Northern Europe adopted a strict Search and Destroy policy that was developed here in Britain. The Royal Free had an outbreak in 1985 and controlled this by using this policy. However, it was believed to be too expensive and consequently more outbreaks occurred until it became endemic. The Northern European policy that works is to Search, Isolate and Destroy the bacteria. Strict screening and decolonising is carried out before patients are admitted to hospital, if patients have to be admitted as emergencies they are put into isolation. Judicious prescribing of antibiotics is also a key in reducing resistance, using the correct antibiotic at exactly the right dosage and time. Over use of broad spectrum antibiotics is not only responsible for resistance but for the problems we have with another killer super bug Clostridium difficile. Multi-drug-resistant bacteria are constantly evolving and we need to act to improve clinical practice and use antimicrobials safely, simple infections will be untreatable and surgery as we know it today will not be possible if we do not act with a global response. We have introduced strict policies here in the UK in an effort to bring this under control. Patients who are going into hospital for surgery are being screened to see if they carry MRSA. If they are found to be carrying it on their skin then they are decolonised with antibacterial wash and an antibiotic cream for the nose. If they are found to be MRSA positive in hospital then hospitals should be placing patients into isolation until it has cleared. MRSA and Antimicrobial Resistance is a top priority for the Department of Health in the UK.